An abscess is a soft mass resembling a large boil that may appear normal, red or pink in color. It may or may not be painful to touch. The central region is filled with puss, bacteria and dead cell mass, which grow and inflate the size of the abscess by inflaming the surrounding cells and tissues. An abscess can be caused by infections, hindrances in the oil or skin glands, and minor breakages or damages in the skin structure. People with a generally weak immune system or a weakened immune system caused due to conditions like cancer, AIDS, burns, trauma, alcoholism or drug abuse can experience abscess formations on their skin more often. An abscess usually forms under the spine, near the hair follicles, around the genital areas, or on the arms or armpits. To cure, it needs to open up to release the puss and bacteria from within. Some abscess ruptures spontaneously over time while others continue to worsen by growing into the underlying tissues and even the bloodstream. Once it reaches the circulation, the spread of the infection can cause a fever and further immune stress. To avoid this, a small abscess may be tackled by warm compressions while a large abscess requires a small incision to be made in order to drain out the puss and debris. It is always better to avoid pressing or pricking into it, as it may lead to further infections and worsening of the condition. 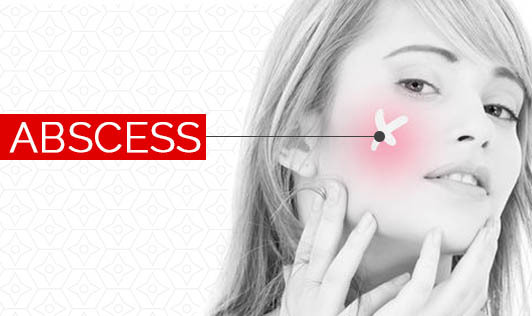 If you have an abscess, it is always better to consult your doctor first. Until then it is extremely important to maintain the skin region clean and dry and covered to stay protected against further complications.